Extreme poverty is defined as an income of $1.25 daily per capita, measured in 2005 United States dollars. 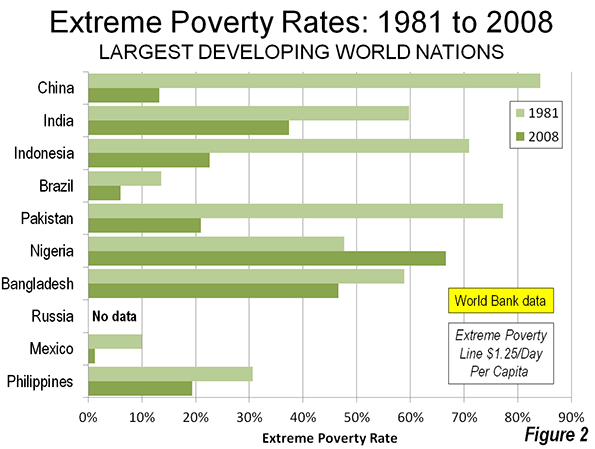 The extreme poverty line is the average of the poverty rate among the "10 to 20" lowest income nations. The World Bank data indicates a nearly 60 percent reduction in the extreme poverty rate between 1981 and 2008, from 52.2 percent to 22.4 percent. By far the largest reduction was in the East Asia and Pacific region (which includes the large nations of China, Indonesia, Viet Nam, the Philippines stretches westerly to Myanmar) where the extreme poverty rate dropped more than 80 percent from 77.2 percent to 14.3 percent. Reductions of more than 70 percent were also experienced in the Middle East and North Africa and Europe and Central Asia, which is by far the most affluent of the developing world regions as designated by the World Bank (generally Eastern Europe, including Russia and Ukraine and the Central Asian nations to the western border of China, such as Kazahkstan). In 2008, approximately 650 million fewer people were living in extreme poverty than in 1981. This gain was dominated by East Asia and the Pacific, which experienced a reduction of 812 million people living below the extreme poverty line. Nearly all of the increase (181 million) in people living below the extreme poverty line occurred in Sub – Saharan Africa, a result of surging populations and still insufficient economic growth. 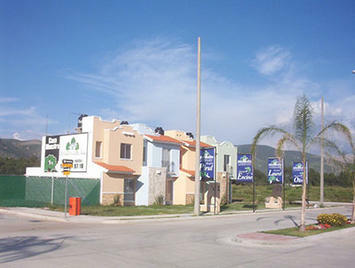 Even so all six of the regions experienced an increase in the number of people living above the extreme poverty line. Further, in four regions, the increase in people above the extreme poverty line was greater than the overall population increase, and was nearly equal in a fifth. 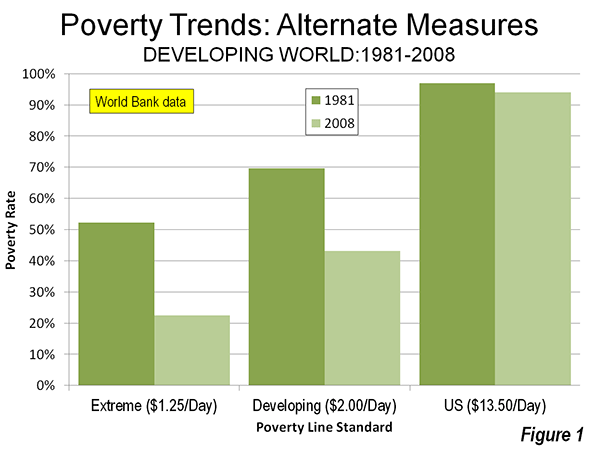 The increase in above extreme poverty population was less than the overall increase only in Sub-Saharan Africa. More than one half of the new population living above the extreme poverty line (1.37 billion) are in East Asia and the Pacific. Another quarter (0.65 billion) were in South Asia, which includes India, Pakistan and Bangladesh. Gains of from 155 million to 233 million were made in Sub-Saharan Africa, Latin America and the Caribbean and the Middle East and North Africa (in descending order). The sixth region, Europe and Central Asia had by far the lowest extreme poverty rate among the region, yet still managed a 50 million person improvement. The largest reduction was in Europe and Central Asia, where such poverty is rapidly becoming a thing of the past. The poverty rate declined almost three-quarters, to 2.2 percent. The $2.00 poverty rate fell 64 percent in East Asia and the Pacific, from 92.5 percent to 33.4 percent. Each of the other four regions also experienced declines in the $2.00 poverty line. There were 109 million fewer people living below the $2.00 poverty line in 2008 than in 1981. The improvement was heavily skewed toward East Asia and the Pacific, where there was a reduction of more than 650 million living below the $2.00 poverty line. There were, however, substantial increases in the number of people living below the $2.00 poverty line in South Asia (275 million) and Sub-Saharan Africa (316 million). 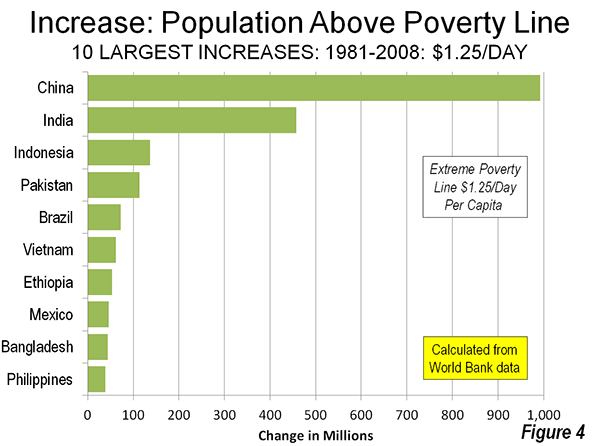 Nonetheless, more than 2.1 billion additional people lived above the $2.00 poverty line in 2008 than in 1981. All regions experienced gains. East Asia and the Pacific accounted for 1.2 billion of this number, followed by South Asia (341 million) and Latin America and the Caribbean (221 million). Despite these gains, the extent of poverty in the developing world is substantial compared to high income world standards. For comparison, the 2008 poverty line for a family of four in the United States is used, which was $13.50 daily per capita. This is more than 10 times the extreme poverty line and nearly 7 times the $2.00 developing world poverty line. Between 2001 and 2008, the percentage of people in the developing world living below the US poverty line is estimated to have declined from 96.9 percent to 94.0 percent. Progress was made in each of the six regions, but even in the most affluent developing world region of Europe and Central Asia the poverty rate relative to the US standard remained at 72 percent. Even in largely middle-income Latin America and the Caribbean, the poverty rate, measured by the US standard was 80 percent. All of the other regions were at 95 percent or more. The highest poverty rate relative to the US standard was in South Asia, at 99.7 percent. Overall, nearly 1.8 billion additional people lived below the US poverty standard in 2008. The number of people living below the poverty standard declined only in the Europe and Central Asia. The largest increase in people living below the US poverty standard was in South Asia, at 652 million, while both East Asia and the Pacific and Sub – Saharan Africa added between 400 million and 500 million. The increase in the number of people living above the US poverty standard was modest, at 231 million. The largest increase was in Europe and Central Africa, at 82 million, while East Asia and the Pacific and Latin America and the Caribbean added approximately 65 million each. East Asia and the Pacific have experienced the greatest reduction in poverty rates, as has been shown above. This is largely due to the substantial progress made by its largest nation, China. China experienced the largest reduction in its extreme poverty rate in the world, with a drop from 84.0 percent in 1981 to 13.1 percent in 2008. Among other developing world nations with more than 100 million population, eight experienced significant declines in their extreme poverty rates. One, however, Nigeria, had an increase. There was no data for Russia (Figure 2). China's below extreme poverty line population declined 662 million, more than 10 times the second largest reduction, in Indonesia at 56 million. 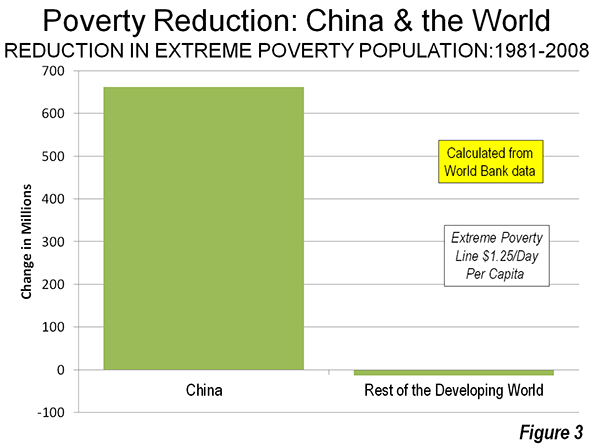 In fact, China's reduction in its extreme poverty population exceeded that of the rest of the world (Figure 3). The number of people living above the extreme poverty line is increasing across the developing world. Nearly 85 percent of China’s 2008 population lived above the extreme poverty line, an increase of nearly one billion from 1981. In India nearly 60 percent of its 2008 population lived above this line, an increase of 450 million. Other large nations experienced large increases in the number of people living above extreme poverty, such as Indonesia (135 million) and Pakistan (115 million) (Figure 4). Only a few nations had reductions in their number of people living above the extreme poverty rate. The Democratic Republic of the Congo had the largest increase, at 6 million. The story on world poverty contains both good news to bad news. There is clearly substantial progress is being made in reducing extreme poverty in East Asia and the Pacific but this has not been replicated in other parts of the developing world. The bad news is that, for all the progress, the standards of living for the overwhelming majority of people remain far below first world poverty levels. Yet, there are signs of hope. A recent report by the Institute of International Finance indicates that over the last decade, Sub-Saharan Africa, long perceived to be synonymous with the world's most intense poverty, has ranked second in economic growth only to East Asia for a decade. Yet, it can only be hoped that the natural aspiration of the world's billions for much better lives will be achieved. The highest priority should be placed on eradicating poverty, as the recent Rio +20 Conference declared.